And if Hindu scripture does explicitly say that he's weak, does it give a reason for his weakness? I felt obliged to answer this Question, as many people misunderstood my this answer. I no way projected Karna as a weak warrior. But there was never an opportunity to express that. Thanks for reopening this thread. In fact Karna was considered one of the strongest. Karna lied to Parashurama that he was a brahmana in order to study under him, since Parashurama had taken vow to teach only brahmanas and not kshatriyas. One day, when Parashurama was resting on Karna's lap, Karna patiently withstood immense pain of an insect bite so as to not wake up his guru. Parashurama woke up and realized no Brahmana could withstand such pain. After finding out the truth, he cursed Karna that in crucial moments of fight, he would forget astra mantras. So, in 3 major fights (Draupadi Swayamvara, Virata Go-grahana, Mahabharata), Karna couldn't win. Nevertheless, there could be another aspect to his weakness, when compared to Arjuna. Both in Ramayana & Mahabharata, the amshas or sons of Surya (Sugriva, Karna) and Indra (Vali, Arjuna) fight against each other. 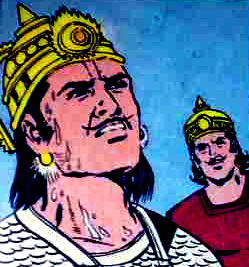 Indra is stronger than Surya in parakrama e.g. Vali is stronger than Sugriva and Arjuna is stronger than Karna. Karna, the mighty bowman, that foremost of all wielders of weapons for whom thou art grieving, has also attained to high success. Behold, O puissant one, that foremost of men, viz., the son of Surya. He is in that place which is his own, O mighty-armed one. Kill this grief of thine, O chief of men. Yes he (Karna) is. Many people degraded Karna. Bhisma considered Karna weak. The Suta's son Karna, a lesser warrior, encountering Partha, came to his end on the second day, like an insect encountering a blazing fire. After the fall of Karna, the Kauravas became dispirited but lost all weakness. Everyone should know this by now. How can Kundala of Karna protect him in battle? What are the 4 Dig Vijayas conquered by Karna? Why is Karna known as Daana Veera? What is dharma as per Karna?